Two water meter inputs, ORP and conductivity inputs with sensors with 15 ft cable, flow switch input, four relay outputs, and Power On/Off switch are all standard features. 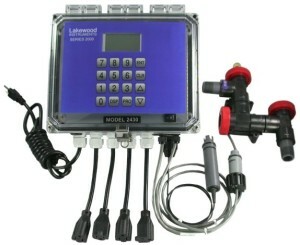 2430e LONWORKS Technology-based ORP and conductivity controller with plumbing and flow switch. Four relays are integral to the system. One is dedicated to blowdown. The others may be configured for ORP, inhibitor feed on conductivity, water meter, percent of time or schedule feed. ORP range is -1000 to +1000 mV and conductivity range is 0-5,000 µS. REMOTE NODE OPTIONS (optional, MUST have -NIN option)NRLY Four additional relays with enclosure (2 per 2000 Series Controller), also available with receptacles and power cord NpH pH/ORP node for a pH or ORP sensor.N420I 4-20 ma input node for up to four 4-20 ma inputs.NDIG Digital input node for up to four digital inputs.NCON Conductivity node for makeup water or closed loop control (node only).NCKT Conductivity node for makeup water or closed loop control with PVC sensor, tee and enclosure. Maximum water pressure and temperature is 140 psi @ 100°F (9.7 bar @ 38°C). MOUNTING OPTIONS (optional)MP Mounting Plate (12 X 21 in.). SOFTWARE AND REMOTE COMMUNICATIONSLRWS Windows-based software program for computer to communicate with 2000 Series.WEBNode IP/TCP device for use with 2000 Series controllers.EZWeb Wireless internet interface for use with WEBNode and 2000 Series controllers.